Bear with me readers.... today I want to get a little artsy-fartsy on you. 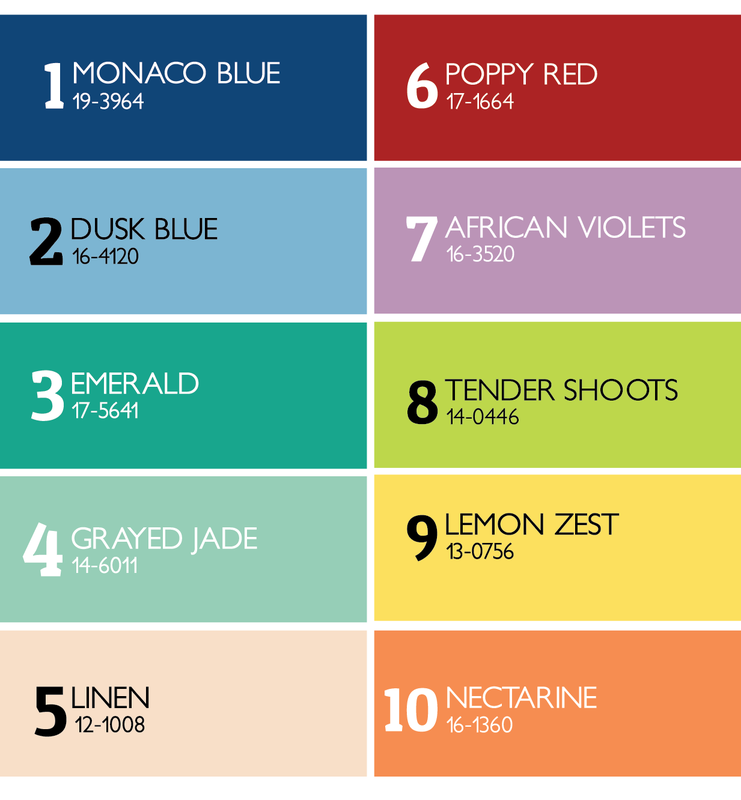 I want to talk about colors. No, I don't mean your own individual colors that we girls used to be taught about, i.e., whether you are a cool person or a warm person or a neutral person. Doesn't it seem no one really talks about those things anymore, at least not as much as they used to? (Somewhere, Mary Kay Ash just sat up from the grave and wants to slap me silly. But really, I'm just not sure those rules are as important as they once were. I'll bet you a pink Cadillac not as much as they did 50 years ago. But I digress). 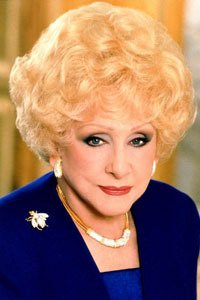 Miss Mary Kay Ash herself. Glamorous til the end. In my dining room, I have a vase with faux figs sitting on a dark wood buffet. The vase has a trellis pattern close to the Tender Shoots color. The figs are Nectarine with Linen spots. And my drapes and roman shade in this room have Nectarine, Lemon Zest, Poppy Red, and Dusk Blue. Moving on to our bedroom, I have a giant bolster pillow atop our duvet color alongside some ikat pillows. An even dustier version of Dusty Red and Tender Shoots, along with some Linen, graces its fabric and trim. We have a set of 4 flower prints framed that have Poppy Red, Lemon Zest, Nectarine, and Tender Shoots in them, and our bedskirt has pale versions of all of those as well. Our stairs have a runner that is a darker version of Grayed Jade. To a tassel hanging from my crystal cabinet. (Nectarine, Lemon Zest and a bluish-Emerald). Moving to the kitchen, one of my favorite Le Creuset pots is Monaco Blue, and a little rug by our French doors to our backyard has lots of that blue, plus Poppy Red and Nectarine, as well. A set of highback wingchairs lives in the little sitting room off our dining room as well, and a silk pillow in Nectarine currently calls one of those chairs home. 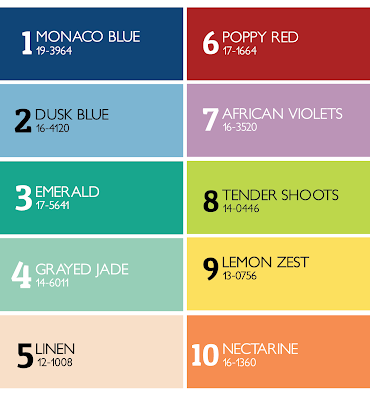 In our guest bedroom, I found Dusty Blue, Monaco Blue, Poppy Red, Linen, Nectarine, Tender Shoots, and Lemon Zest. And I am sure I missed some. Our kitchen's French doors have roman shades that have Nectarine, Poppy Red, and a bluish-Emerald in the fabric's design. A set of club chairs on our upstairs landing have a lot of Nectarine and Lemon Zest in their fabric, as does a pillow sitting atop one. Last but not least, my favorite place mats have a dark version of the almost-peachy Linen in them, along with Tender Shoots and Nectarine. Well that's all for today, folks! Thanks for indulging me in my color ramblings. Have a great week! !